The Quality Hotel Grand, Kristianstad is located right in the city centre, within easy reach of all the main attractions. The hotel has a gym, restaurant and bar, as well as conference facilities for up to 110 people. This is a cash-free hotel. The Quality Hotel Grand, Kristianstad is beautifully located conference hotel in central Kristianstad. In addition to a popular restaurant and nightclub, we also offer eight conference rooms for up to 110 participants. We hope to welcome you some time soon! You'll be staying right in the city, but in a quiet location opposite Kristianstad's most precious heirloom from 1628, Trefaldighetskyrkan (Church of the Holy Trinity). Parking is secure and easy in our garage that is directly connected to the hotel. From here you are within walking distance of shops, galleries, restaurants, green spaces and the protected green belt area of Kristianstad's Vattenrike Biosphere Reserve. If you arrive by bus or train, Quality Hotel Grand, Kristianstad is just 150 metres from Kristianstad C Central Station. Quality Hotel Grand, Kristianstad is cash-free, which ensures added security for our guests and visitors. More information about this can be found under FAQs. Hold your conference here! We offer experiences, inspiration and support. Quality Hotel Grand, Kristianstad has 8 bright meeting facilities for up to 110 people. Our wonderful lunch buffet with vegetarian options and salad buffet is much appreciated. You do know that ice cream and popcorn throughout your conference stay are included here, don't you? A guaranteed success! We have a gym with exercise bikes, treadmill, weights, barbells, pilates balls, TRX bands, kettle bells etc. If you'd prefer to go jogging, we have maps at reception. Enjoy delicious food and beverages in Quality Hotel Grand, Kristianstad's lovely Grand Bar & Matsal restaurant. We serve breakfast, lunch and dinner in a stylish, comfortable environment. You can relax while our staff cater to your wishes. Grand Nightclub has become a well-known institution in Kristianstad's night-life scene, with its triple entertainment. A large nightclub with many rooms and many different styles and experiences. There are three colourful clubs under the same roof here, all with completely different characters. Free entry for all our hotel guests. Recommended age 23 years. Sweet Dreams Stay is a collaborative project with UNICEF, helping children affected by human trafficking get a safe night's sleep.To contribute to the project, we only clean your room if you request cleaning when you stay two consecutive nights or more at the hotel. We will donate 10 SEK to UNICEF for every room that we do not have to clean. This will also help to reduce the use of chemicals, energy and water. Together we can make a difference! Find out more about Sweet Dreams Stay here. Kristianstad has a unique cultural history, where you can visit Konsthallen art gallery, Järnvägsmuseet railway museum, Filmmuseet film museum and Naturum wetlands. Our beautiful city has cafés, parks and shops, all in a charming environment. 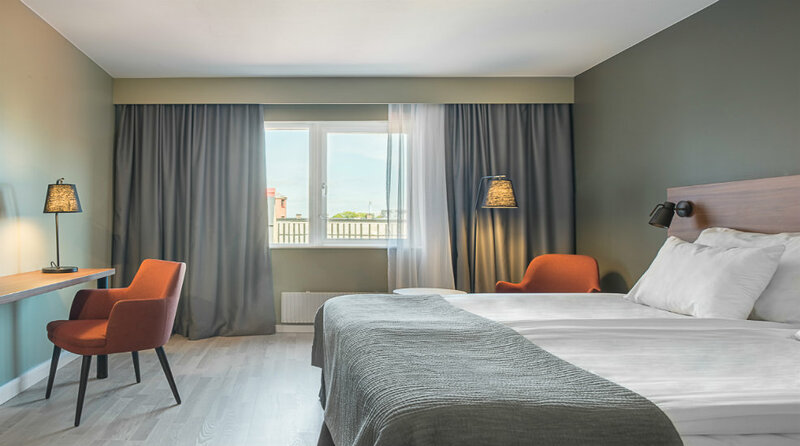 There are many opportunities for an exciting yet relaxing stay here in Kristianstad, and it all starts with us at Quality Hotel Grand, Kristianstad. telephone +46 44 24 62 46.